Having missed Magh Bihu (Assamese harvest festival) for the last 6-7 years, this year I managed to be right there amidst all the action – ‘meji’, ‘jolpaan’, ‘til pitha’, (rice powder roll stuffed with jaggery, sesame seeds, etc), ‘narikol laddoo’ (coconut balls), ‘ghila pitha’ (ghila pitha is a type of pancake which gets its name from ‘ghila’ meaning knee cap in Assamese; it’s so called because the pitha resembles a knee cap) and ‘til laddoo’ (sesame balls) just to name a few. Grate the coconut white. Mix the coconut and sugar and then pour them in a hot pan (grind the clove seeds and add to the mixture if you want). Stir the mixture in low flame till you get a sticky feeling (remember the stickiness has to be right for you to make a laddoo); to gauge the same, try making a laddoo. If you are able to make one, it means the mixture is ready. Turn off the gas. 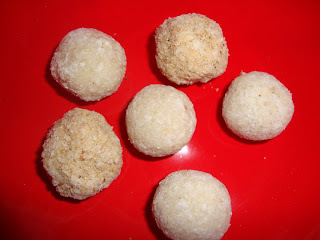 (Tip: If it’s too hot for you to make the laddoos, apply cold water on your hands before doing so).